I grew up in Sooke, BC, and came to SMS in 2014, beginning my high school journey and moving into my new home in Grade 9. I remember touring the campus for the first time and how it seemed so expansive and intimidating. I was nervous about starting at a new school and even more scared about moving into residence, but soon after my tour, I was nothing but excited! I knew residence would be a good fit because the support I needed would be provided, while also allowing me to develop my independence in a safe, nurturing environment. Living on our beautiful campus filled with nature is very convenient. We are centrally located in Victoria, so anywhere you want to go is relatively nearby and easy to access. There are also many hiking and walking trails around the Saanich area, so there is never an excuse to stay indoors. “In Barton House, Lotus has had a very stable and accepting, supportive environment from which to explore who she is, explore her voice, and discover healthy personal boundaries while staying true to her generous and supportive nature. This is no small feat. I think that what is unique to boarding is that we support and care for the girls very much, but our own identities are not bound with them, so possibly there is more opportunity to explore who they are creatively, academically and within relationships, and within a grounded, structured, skilled and supportive environment,” said Karla Dolinski, Barton House Resident Parent and Residence Counsellor. For me, the best part about living in residence has been having my closest friend’s only footsteps away from me or in the neighbouring houses. These girls have become my main circle of support, and I’m not sure I would be where I am today without them. On occasion, I have found myself feeling like I did not have the same privilege of girls living off campus, but I always reminded myself that these are experiences that I am gaining that I could not get anywhere else. In residence, there are several activities throughout the week and on weekends, and the options available are pretty amazing. Although there are over 30 girls in each of the houses, you eventually learn everyone’s name and grow as a family. My favourite memory of residence is having picnics in the field, making a swing in the stairwell, and having long chats with the House parents. I know that when I leave SMS, I will have many fond memories that will carry me forward as I continue my learning journey. There is so much I will never forget from the past four years. “I have seen enormous growth in Lotus in the past 2 years as her Resident Parent. 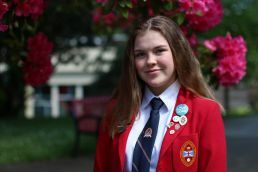 Lotus is a very kind and enthusiastic young woman who values her friends and works hard to foster an inclusive environment around her,” said Dolinski. To students considering boarding, believe me when I say that it will become easy to call residence your home—it was for me. The house parents are amazing people, and being in a multicultural community allows you to make friends from all over the world. After I graduate in June I plan to continue my studies at the University of Victoria in the Faculty of Science and explore new passions as a young adult.